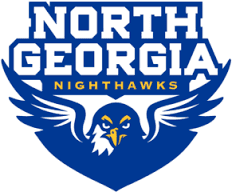 DAHLONEGA, Ga. – The University of North Georgia women’s basketball team used a strong second half performance to distance themselves from visiting Montevallo on Wednesday, taking down the Falcons, 71-56. The Nighthawks advance to 19-7 on the year with an 11-6 mark in the Peach Belt Conference. Amber Skidgel started the game off on the right foot sinking a three-pointer just nine seconds into the contest to hand UNG an early lead. The Falcons led for just 15 seconds of game play after a Jazmine Stubblefield layup at the 8:20 mark, but North Georgia would take the lead for good with 8:05 left in the first quarter on Jordan Livesay‘s three-point basket. – Four Nighthawks scored in double figures on the night, led by Amber Skidgel‘s 18 points. – Mackenzie Darrah and Deana Blankinship were tied with the team lead in rebounds with seven boards on the night. – This marks the ninth consecutive win for North Georgia over Montevallo and the fourth consecutive year UNG has earned a series sweep over the Falcons. – Even though the Nighthawks picked up a victory tonight, Clayton State’s slim win over Young Harris locks in the second-seed for the Lakers. North Georgia is locked in as the three-seed from the Western Division for the Peach Belt Conference Tournament. UNG will play host to No. 5 Columbus State on Saturday, Feb. 18. Tipoff is set for 1:30 p.m. at Memorial Hall.